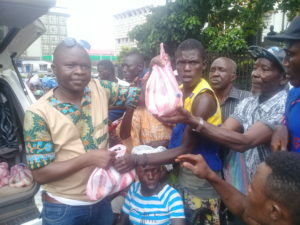 Disable Children Empowerment Foundation, a non-profit organization, has provided cooking items and drinks to beggars around the Cotton Tree area in central Freetown. It is not the frst time that the Founder and National Director of the organisation, Mustapha Koroma, was doing such humanatarian gesture to those that cannot afford it. Inspired by a strong desir to cater for children and the less fortunate, Mr. Koroma had undertaken so many humanitarian activities across Freetown, using his meager resources. “The objective of the organisation is to reach out to the needy, poor and under privileged with the much needed assistance to change their lives. I decided today to reach out to you because I share your pain and constraints. Rest assured I will continue to visit you to give you my own little support,” he said. Mr. Koroma regards himself as a fighter and an advocate for the progress and development of children and the poor in society, which is why he is seeking support from the government and other people to be able to do more. He assured the beneficiaries that they were not alone in their daily struggles to eke for food, clothing and shelter as he will be visiting at some point with other support. “My heart and mind is with you always. This will surely not be the last time I will visit you,” he assured. The beneficiaries were full of praise and joy when they received the items, and some of them said the gifts would help them prepare delicious meal at home. “We are very grateful to you sir for this help. We appreciate it so much and we hope you will continue because we are in dire need of such support,” said the beggars in joyous mood. The organisation started full operation in 2017 after registering with the Ministry of Social Welfare, Gender and Children’s Affairs and other autthorities. Mr. Koroma also spoake about his intention to constrct an orphanage that would cater for chidren and streets beggars, and urged the gernment to provide him with a piece of land and additional support.